This doesn’t seem right, does it . . .? After all, do you blame me for wanting more and more of these? These are the winners in this year’s tomato contenders: from lower-left on the chair, clockwise: Beauty King, Tess’s Land Race Currant, Striped Roman, Granny Cantrell, Golova Negra, Dr. Wyche’s Yellow, Chocolate Striped Cherry, Yellow pear, Sun Sugar, German Orange Strawberry. I want to explain to you why I can’t stop myself from putting in more and more (and more) tomato plants each year. I mean, I really would like to explain this. And I would, if I understood it myself. All I know is that when I begin to receive the seed catalogs at, oh, say, probably sometime around Thanksgiving, I am in a receptive mood to dreams about glorious garden tomatoes. Enough time has elapsed by then to take away many of the memories of garden toil and worry, and it has been a good month or so since I’ve had the luxury of a ripe, garden-grown tomato on my table. And I really like that particular luxury. There are so many different tastes in the various types of tomatoes, especially if you plant heirloom varieties. Some are milder-tasting, some of amazingly juicy, some have almost a tropical flavor. It would be worth growing different varieties for the visual delights, too, inherent in them: there are striped tomatoes and there are those that stay green (sometimes green and striped) even when they are ripe, and then there are the pink ones and the orange ones and the yellow ones . . . I tell you, I can’t stop at just one color! Here’s a perfect pink Brandywine, picked just as it’s turning in color. That said: there are definite winners and losers in my line-up, every year. I hate to blame the “losers” by name (so fond of them all I am, you see) because I realize it may be my soil, or my garden methods that could be to blame. For example, a “Chocolate Stripe” tomato that I planted this year I will not plant again, because of the odd and disturbing cracks all along the top on every single tomato. Heirloom tomatoes will crack and split, especially after a heavy rain or watering, but some varieties do this more than others. This one wasn’t happy in my garden, that much was clear. These Chocolate Striped Cherries are my favorite go-to snack in the garden. I save seeds from the tomatoes that I am especially happy with from year to year, and I thought that it might be worthwhile to share that secret information with you. I won’t tell you (even under threat of pain) how many plants I actually put in, though. So don’t even ask. Pink Brandywine (pictured above): This is the most popular heirloom vegetable grown, and I can see why. It’s big and meaty and very tasty and a reliable producer of really nice big tomatoes. I grow it every year, and will continue to do so! The potato-leafed plants did well in last year’s awful drought, and also in this year’s cooler temps. Just an outstanding tomato! Beauty King: (In the group photo) This is a new striped variety that I tried, and I was really impressed by the flavor. And of course I love the look of striped tomatoes, as you might imagine. It did produce more irregularly-shaped fruits and cracking was an issue with some of them, but the taste made it worth growing. Not as big a producer, but worth it, for the stripes. Tess’s Land Race Currant: I’ve grown this tomato before, and I really love it. The plants are tremendous, and from an early date are liberally covered in blossoms. The tomatoes are the smallest I’ve grown, and delicious and sweet. I pick them by the “spray,” not individually, as they are so tiny. They’re fun to toss in a salad and are so sweet that sometimes I can even coax little Mack (not a tomato lover) into popping them into his mouth. And that’s something. Striped Roman: You can’t really see it in this photo, but this tomato is really a beautiful striped one, and the plant is a great producer of Roma-type paste tomatoes. Some of them get much larger than the one pictured, and I like to grow them for sauces and salsa. Also, for the stripes. Granny Cantrell German Red: I can understand why Lettie Cantrell of Kentucky only grew this one tomato. I’ve been growing it for a few years now and I really love it. 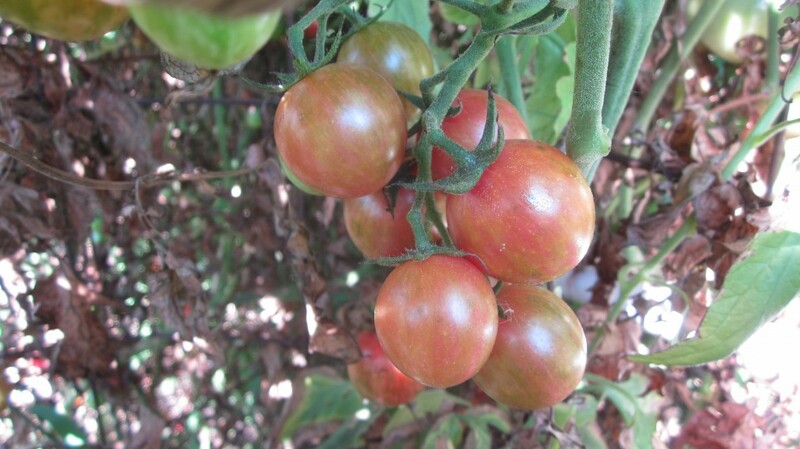 It is a very reliable producer, putting out clumps of big pink beefsteak-type tomatoes until frost every year, and the tomatoes are nearly always free of cracking and flaws. Lettie used to save seeds from the biggest tomatoes every year, and I do the same thing. Golova Negra: I really love this tomato. This is my first year to grow it. It is an odd color on the outside–purplish-brownish-greenish–but when you slice it,wow! It is just breathtakingly beautiful inside, a very rich purplish red. And it is delicious, extravagantly juicy, and a great producer, to boot. Dr. Wyche’s Yellow: This is probably my favorite newbie this year. This yellow tomato is a great producer of big beautiful yellow-trending-towards-orange tomatoes which don’t have a tendency to crack or split. This heirloom was introduced to Seed Savers Exchange by the late Dr. John Wyche, who at one time owned the Cole Brothers Circus and used the manure of elephants to fertilize his gardens! The fruits are a good size, usually about a pound, with a nice smooth texture and sweet taste. I love a great tomato with a great story, don’t you? And now for those little sweeties: the Chocolate Striped Cherry was the cherry tomato that I tended to reach for first in the garden this summer (thought I regularly sample them all!). It was a tremendous producer, and is sweet and juicy, and (for the artists among you) each tomato is unique–some greenish striped, some red and brown. I love that. The Yellow Pear has always been a favorite, mainly because my Mom always grew them, and they are shaped like pears, of course, which is cute and fun. The yellow Sun Sugar is probably the sweetest cherry I grow, and looks awful pretty in with all the red and orange cherry tomatoes. And German Orange Strawberry is another newbie which produced great buckets of cherry tomatoes, strawberry-shaped (as you can perhaps see in the photo) and varying in sizes from the small one pictured, to fruits nearly as big as a golf ball! These are crack-free and stay good longer than many cherry tomatoes. Well, I think that’s it! Those are the tomatoes that I’ll save seed from, for next year. And by the way, do you know how to save seeds from tomatoes? If you buy heirlooms from the farmer’s market, or if you grow them yourself, it’s so easy to save the seeds. Pick out the tomatoes that do the best in your garden soil, and save the seeds from the best ones. By doing this you’re not only encouraging the development of the best tomatoes for your own garden, you’re being very smart in that you’re preserving the genetic diversity of these beautiful tomatoes, and you’re selecting characteristics that make the tomatoes even better! Now don’t you feel smart? In case this process is a little fuzzy to you, you can look at this very helpful post about how to save tomato seeds from my friend Mr. Brown Thumb. By the way, this site is rich in posts on how to save all kinds of seeds, so it’s really worth a look if you’re hoping to save seeds from your garden plants this year! Thanks again for reading, Gentle Reader. Happy gardening, and happy day! And no, I’m still not going to tell you how many tomato plants I put in this year . . . no matter how much you beg . . . But I’ll give you a clue, since you’ve read this far . . . the number is more than a hundred . . . but less than . . . a million! Oh, by the way, here are a few sources for seeds. Some of these catalogs carry hundreds and hundreds of kinds of heirloom seeds, and it’s really fun to curl up next to the fire in a couple of months and plan which varieties you’ll try next year! 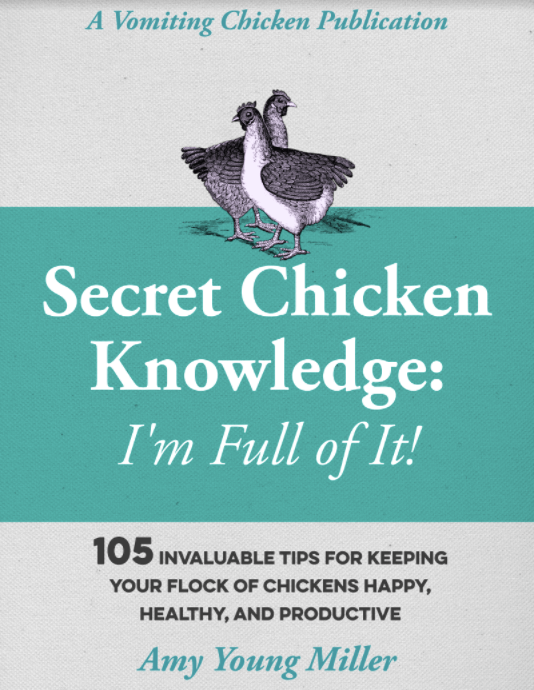 By the way, I’m participating in a blog hop this week over at Frugally Sustainable. Check it out! I love the term “gentle reader”. I won’t ask how many tomatoes plants you have- I just imagine a lot! I planted 2 types of tomato seeds and whoa- I got a lot more plants than I expected. Last year I wasn’t as lucky so it was a big surprise to have as many as I do. I’m sure I’m not where near the number you have! Good for you! Thanks Denys! Good luck with your gardening! A very interesting post! I’m going to have to try the idea of saving seeds from my favorite tomatoes. I really didn’t realize there were so many types of tomatoes!! Only the heirloom tomatoes reproduce true to type, Kim. Most of the hybrid tomatoes won’t, so you may want to check out if your tomato plants are hybrids (Big Boy, Better Boy, Early Girl, etc.) or heirlooms. True confession time! (gulp) My husband and I have been growing heirlooms since at least 1978, which was my first gardening year (having grown up in an apartment in New York City). Back then they didn’t call them heirlooms. Like Rutgers (now a “heirloom” back then it was sold as a “regular” tomato and I think it’s still a great tomato) also Mr. Stripey aka Tigerella (got that from Thompson and Morgan; cracked like crazy but boy did it taste good). 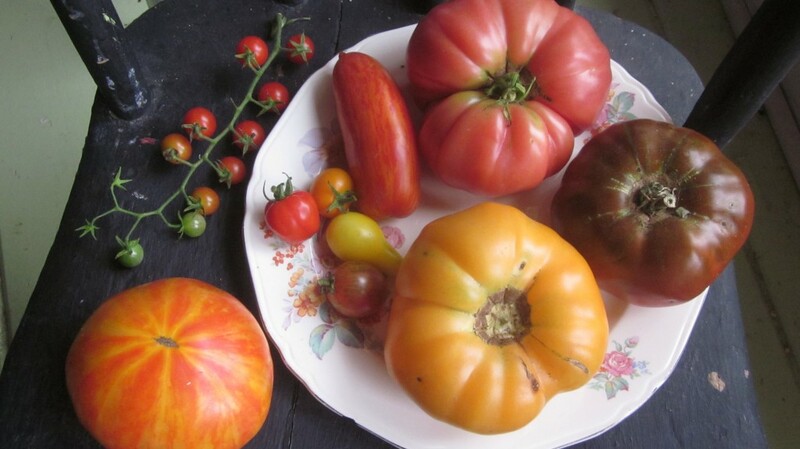 We’ve, sadly, been disappointed by most of the heirlooms we’ve grown and (here’s the true confession) a lot of what we grow now are hybrids – especially the tomato that does the best for us – Juliet. Heirlooms need more love than we can give them. I hate to admit that! Oh now, that is some crop. I need to investigate how we can increase ours next year. Seriously? Can we get heirloom seeds here? I’ll have to go and check. We have four tomato plants, I am guessing you have a lot more ? I’m sure you can obtain heirloom seeds there in the UK. I went back and put a list of seed catalogs that carry heirloom seeds into my post, if you’re interested. My favorite is the Baker Creek Seed Company, probably just because of the huge and colorful pictures!! They had seeds for a few BLUE tomatoes last year. I tried to order them, but (no surprise!) they were sold old by the time I made my request! Listen, send me a private message with your mailing address and I’ll send you an assortment of seeds from my tomatoes this year. Are there any of mine, in particular, that you are interested in? I’d be happy to do this! And then you could save seeds from now on and have your own little patch of really awesome tomatoes! My husband and I really love growing heirloom tomatoes, too, and he never asks why have so many. One of our favorites is the Sausage Cream tomato. It is a white to yellow Roma style paste tomato. 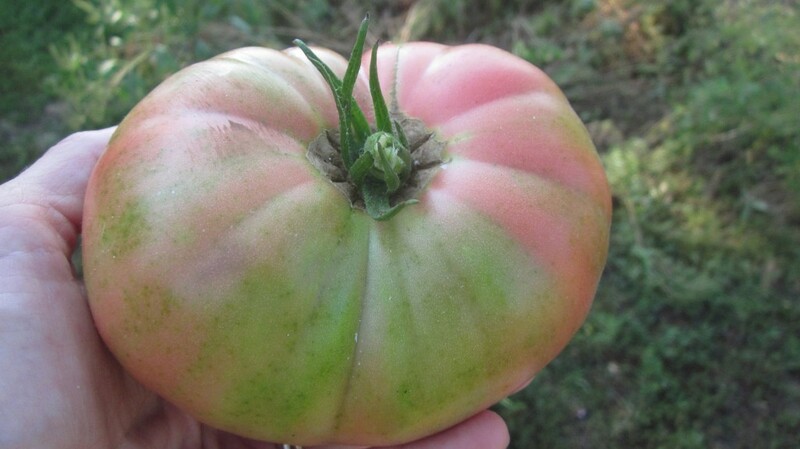 Another is Heirloom Italian which produces huge, delicious, paste type tomatoes. One of these weighed over a pound this year. I haven’t tried the ones you mentioned, so I will look for them for next year. Wow, Kathy, a paste tomato that produces tomatoes over a pound! Thanks for sharing that, I’ll have to check it out! You heirloom tomatoes look wonderful. I’ve never seen anything like them. Some even look like pumpkins. If you’ve got the room to grow them, do so. Hold your head high. Be proud. Maybe you should enter the Guinness Book of Records. Do you have farmer’s markets there in the UK? Surely there are old-fashioned types (like me!) who grow heirloom tomatoes and other heirloom veg. It sure would be worth checking out! Thanks for the encouragement, by the way! Too many city folk think there is only one kind of tomato- the one that comes in a package of three at the supermarket. Thanks for reminding us of the plethora of choices that truly make our lips water. Thanks for taking a look, Roy. Heirloom tomatoes are such a joy to grow (and to eat!) and I can’t imagine ever being happy with those supermarket tomatoes again, after tasting what a “real tomato” tastes like! I love this! What a great obsession! I like a rose but a tomato beats a rose any day. Totally love all your varieties. Thanks for sharing on the Home Acre Hop. 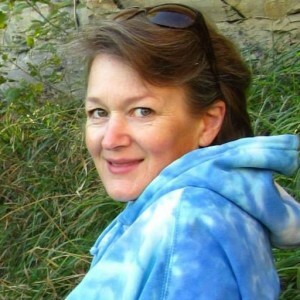 What a joy to know you and to have, in addition to other connections, a gardening affiliation! I’ll writemore next time perhaps. Ruth just called supper! Well, Mr. Lawrence, I feel the same way about knowing you! One thing about gardeners–you always have plenty to share and talk about!